"Exhaustive, spectacular, often dazzling in its ambition… one of the wonders of epic cinema." 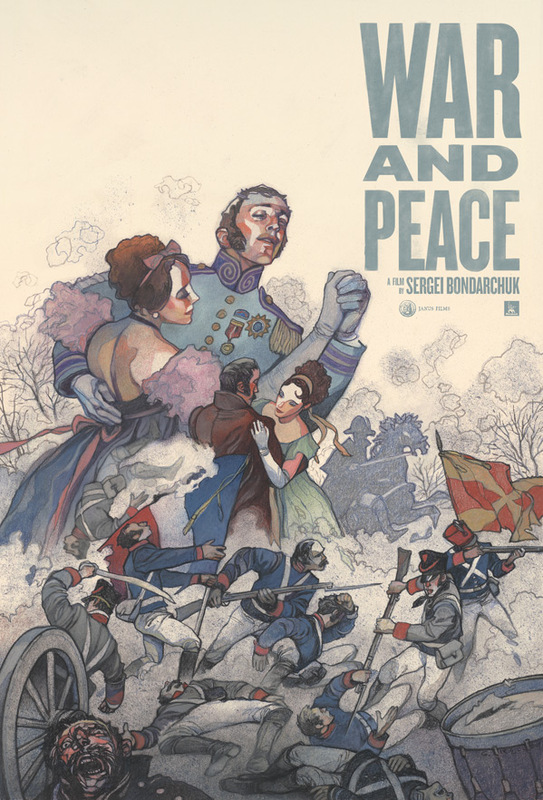 Janus Films has unveiled a grand new trailer and a beautiful new poster for the restored re-release of War and Peace, director Sergey Bondarchuk's epic Soviet Russian film from 1966 (which won the Academy Award for Best Foreign Language Film in 1969). This eight-hour long epic, based on Leo Tolstoy's book, contains two main story-lines that are complex and intertwined. One is the love story of young Countess Natasha Rostova and Count Pierre Bezukhov, who is unhappy in his marriage. The other story is the "Great Patriotic War" of 1812 against the invading Napoleon's Armies. The people of Russia from all the classes of society stand up united against the enemy. Janus Films will re-release this cinematic epic starting this month in NYC, featuring a digital restoration of the picture and sound using a 2K scanner. Check out the official poster + trailer below. At the height of the Cold War, the Soviet film industry set out to prove it could outdo Hollywood with a production that would dazzle the world: a titanic, awe-inspiring adaptation of Tolstoy’s classic tome in which the fates of three souls—the blundering, good-hearted Pierre; the heroically tragic Prince Andrei; and the radiant, tempestuous Natasha—collide amid the tumult of the Napoleonic Wars. Employing a cast of thousands and an array of innovative camera techniques, Sergei Bondarchuk conjures a sweeping vision of grand balls that glitter with rococo beauty and breathtaking battles that overwhelm with their expressionistic power. As a statement of Soviet cinema's might, War and Peace succeeded wildly, earning the Academy Award for Best Foreign-Language Film and setting a new standard for epic moviemaking. War and Peace is directed by Russian filmmaker Sergey Bondarchuk, of other films including Fate of a Man, Waterloo, Mexico in Flames, and Ten Days That Shook the World. Based on Leo Tolstoy's seminal novel. Janus Films will re-release War and Peace in select theaters starting on February 15th this month.